Macedonian Association of Translators and Interpreters (MATA) is getting ready for another exciting event to mark the end of a very fruitful year. We are happy to announce our Fifth, jubilee conference! As we are celebrating five successive conferences, this year’s conference will be FREE for all participants! This year we will focus on the surrounding region and we will cover topics that interest us the most. The participants will have a chance to get acquainted with the work plan of the Association, to hear different opinions on community interpreting, and to share experiences with obligations and duties in courtroom interpretation. 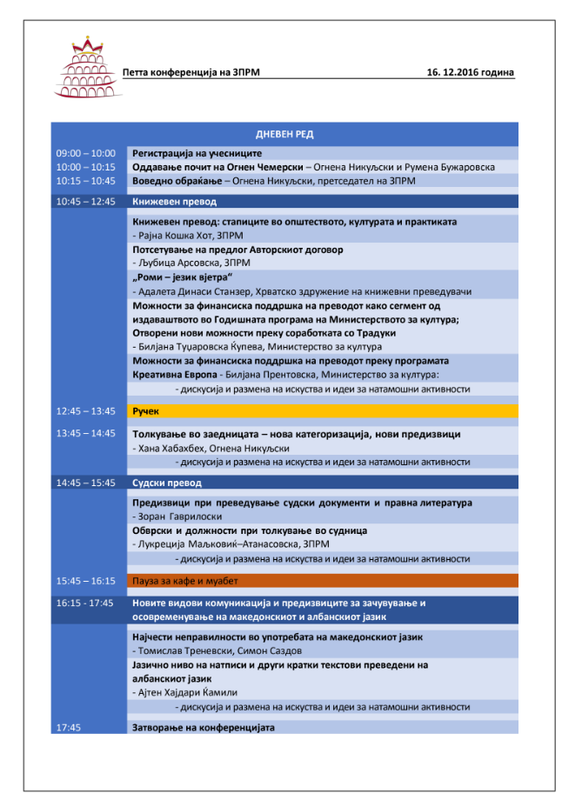 They will also learn more about the situation of literary translation and translator in Macedonia. Conferences are an excellent way for getting to know each other, to unite for high-quality and more professional work conditions. 10:15 Community interpreting – new categorization, new challenges. Macedonian language specialists: The most common irregularities in the use of the Macedonian language. МАТА is a professional association founded in December, 2010, by 10 prominent freelance translators and interpreters, and professors. Copyright mata.mk | All rights reserved.